23 Meteors in One Hour. So last night wasn’t the peak of the peak; but Les UDs left their Big Meadows Lodge room at 3:18 AM anyway, figuring they’d for sure be the only people at the Big Meadow down the road, which has enormous dark skies. They dressed warmly – mid-August evenings turn out to be cold here, especially when you’re sitting (beach chairs) in the middle of a vast wildflower field. The short drive over there put UD in mind of the night the lights went out over much of the United States in 2003, and Les UDs drove back from Cooperstown to their houselet in Summit in Total Rural Darkness. And Total Rural Silence, something about the gorgeous witchy world having hushed them. So here’s a family lying in sleeping bags at the entrance to the meadow – quiet father, mother noting each meteor, and small daughter entirely into the experience. A kid, thrilled to be lying on the cold hard ground in the middle of nowhere … Three other cars stood in the parking lot, meaning people had walked through the meadow to distant viewing points. “Thought we’d be the only people here,” said UD to the sleeping baggers. “Oh, we set the alarm for 2:30,” said the father. Mars, the Milky Way. And meteors diving out of the black lagoon – some mere flakes, which we didn’t count, some white missiles with fireballs, missiles so bright they left stellar contrails. With each big one we whooped and clapped and considered again the bizarre good fortune that first hoisted us up onto Skyline Drive and then settled us down into beach chairs under galactic suns. Barred owls hooted as the heavens rained. And through the tree’s branches came the entire firmament as it is spectacularly to be seen at three AM mid-August in front of Big Meadows Lodge, Shenandoah National Park. Oh but then. Then the sky blazed up with a big meteor! I saw its fireball and was amazed. As it blazed out I raised my arms and let rip a victory whoop because this after all was the moment of triumph for ol’ UD, who has been trying for years, every August, to see the sky blaze big just like that. 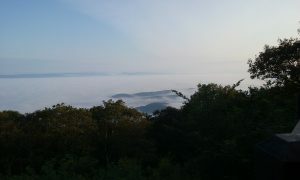 … Big Meadows Lodge, has spotty internet, so UD can’t at the moment share the long-view-in-cloud-and-sun picture she just took on her first hike. The mixed weather means thick smoky hills out to the edge of the earth. The climb up Skyline Drive featured fairy tale woods: Green-gray barks and shaggy canopies visible through gray mist. Sometimes sunlight broke the mist. I.e., it will be a miracle if any perseids are to be seen tonight. But the world from the Big Meadows balcony rolls out beautifully, and UD is more than happy to make do with that. The air is cool, nature madly green from all the summer rain, and my immediate view of parents piecing animal puzzles together with their children as they wait for the dining room to open extremely pleasant. UD – a charter member of the Hell is Other People club – finds the subdued company of damp weary hikers more than tolerable. Faithful readers know of UD’s annual, not terribly successful, perseids outings. She’s got a little house in nowheresville upstate New York, no lights anywhere, a true dark sky, and she has sat in its front meadow many a chilly August night over the years, looking up at the enormous firmament. (Actually, news flash: UD‘s country house has suddenly gone from a nowheresville location to a destination location! Look what’s moved down the lane. That pond you see if you check out the photos on the website was the work of UD‘s old friend, Wojciech Fangor and… well, you can put Fangor in my search engine if you want that story…) But for all her effort, she’s never experienced a true meteor shower – just occasional shooting stars in the course of a few hours. This year, Les UDs are going to Shenandoah National Park – two hours from ‘thesda – because it’s apparently the best place for hundreds of miles around to see the perseid meteor shower. There will be a Night Sky Festival at the park while we’re there. So even if UD is again disappointed this year, she will at least be surrounded by experts telling her precisely what’s up there and why. Obviously, she will extensively blog this experience.